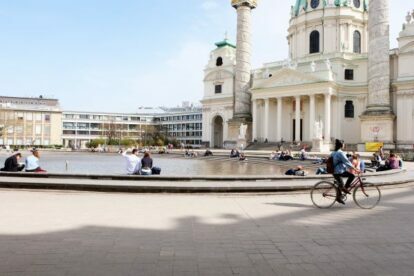 If you have yet to visit the pond on Karlsplatz, it definitely deserves to be far up on your Viennese bucket list. The oval pond was built in the 1970s and seems to fit in just perfectly with the adjacent urban jungle. Its border is made out of concrete, slightly elevated off the ground, with a few steps on either side leading up to the edge and into the water, respectively. I’ll be honest, the pond itself is not extraordinarily spectacular, but there is absolute beauty and a magical feeling on the surrounding square. Karlsplatz is always busy, vibrant and full of life. You will experience it quite differently depending on the season you are visiting. With spring around the corner people start to reappear in public and discover their former favorite lunch break spot at the pond. In Summer students and locals gather around the pond having beers or cocktails, enjoying the mild and warm evenings, tiping toes into the water while gazing at the reflection of the Karlskirche, which is lit in rainbow colors. If you are lucky you might just hit the time of the “Popfest” (25th until 28th of July), a multi day music festival with a stage inside of the pond, hosting mostly national musicians on the rise. The festival is overly cool, free of charge and packed with locals.